The Second Necklace Challenge Reveal! The Necklace Reveal makes me feel like a little kid on a playground. I want to go play here, no wait, over there, now that way! It’s a kind of giddy fun to hop from blog to blog and discover what everyone has created. The rules of the game are explained in The Challenge. Briefly, we all bought (or tried to buy) the same beads. We had to use these beads, plus our own focal bead and clasp to create a necklace. We could use 2 additional types of beads of our choosing. I ran into an extra challenge because I couldn’t get all the beads we were supposed to work with. I went back to Michaels 3 times and they never had the clear beads with the silver edges (my favorite beads of the whole selection). They also didn’t have the faceted natural colored, oval mother of pearl beads. I couldn’t find any good substitute for the clear beads, so I just left them out. I substituted white (bleached) mother of pearl ovals for the unbleached ones. The chunky black quartz was the biggest challenge to work with. I pulled out my drawer of Art Glass and when my eyes lit on this fabulous Black Sea Sand Dollar bead from Beads and Botanicals I knew it would be perfect with the black quartz. The rest of the design process flowed easily from that point on. I strung a quartz bead on a gunmetal headpin and sat the Black Sea Sand Dollar bead above it. I attached the pendant to the gunmetal chain and wired some of the peacock colored pearls and some black Delica seed beads to a short length of the chain. 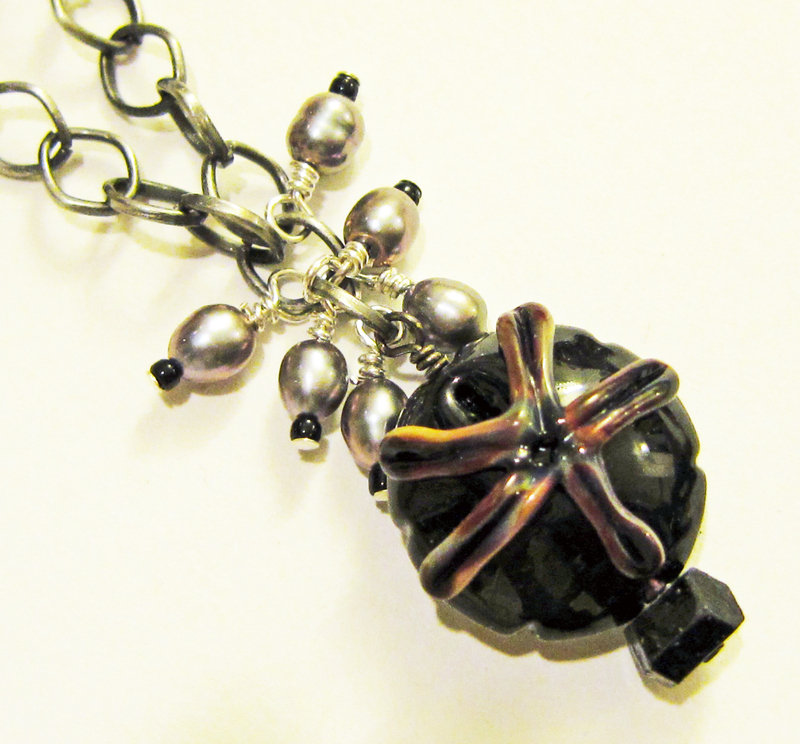 I like the grayish-purple of the pearls with the black of the pendant. I framed the mother of pearl ovals with black and clear organic seed beads from Beads and Botanicals and then strung an alternating pattern of pearls and black Delicas. 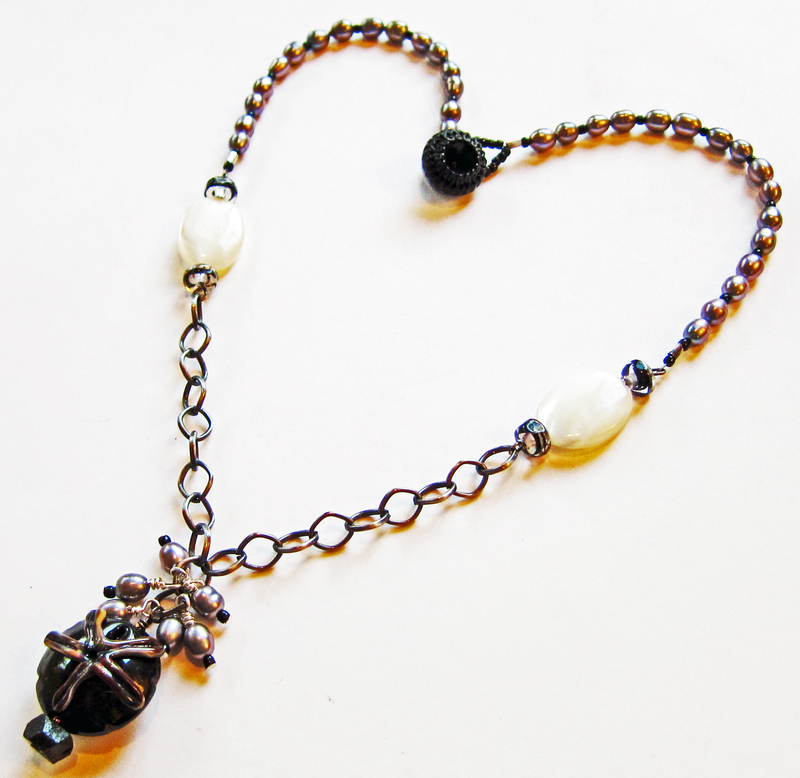 I finished the necklace with a pretty vintage black German glass button and loop clasp. Thank you for visiting my blog. I encourage you to check out the other fabulous artists whose links are listed below. You will marvel at how each person has come up with a totally individual creation, even though we’ve all been working with the same beads. Have fun! Please Visit These Wonderful Artists! This entry was posted in Bead And Jewelry Challenges and tagged Beads and Botanicals, button clasp, Linda Landig Jewelry, Lorelei Eurto, Michaels Challenge, necklace, pendant by Linda Landig. Bookmark the permalink. This is really cute (even without those other beads). Love the simplicity and the focal. Thanks, Nicki! Ilve the the focal bead, too! I think you tackled the challenge well! Thanks for participating! Thanks for hosting this challenge, Lorelei. I love how your necklace turned out. I hate when you can’t find the beads you need. You did a great job overcoming that challenge though! The necklace is beautiful, something I can see just being thrown on for an added UMPH! Thanks. Yes, I think it would go with lots of outfits–weekend to work attire. I like your substitutions! That is the thing with challenges.. they challenge you! I like those clear beads too. Something to keep my eye open for. Thanks for sharing your process. Lovely design. Thanks, Erin. I love these challenges and am looking forward to the next one! Yes I went back e fw times too. You did a great job – that focal is perfect! Thank you, Patty! I love the focal, too, and for matter everything by Beads and Botanicals! Thanks, Jenelle – cool focal, huh? What a beautiful necklace! I love Beads and Botanicals. I just bought a bunch of their beads myself. The sand dollar is amazing. I love the button clasp too! Very nice! I love your design! Simply elegant and the clasp is really beautiful! Thank you Erin. I love using vintage glass buttons for clasps! I love what you did with your beads! I had the same trouble finding the same beads. However, I think we both made good use of what we had! Greta job! Thank you, Mallory. Wasn’t it frustrating to not be able to find all the beads? Next time we are ordering from Fusion Beads. That should make the process easier. Nice — I love seeing how people are able to improvise. Great job!